It was with great pleasure that President Judi Murakami presented the American Rhododendron Society Bronze Medal to Wolfgang Hoefgen on June 17, 2017. The ARS Bronze Medal is awarded for outstanding contributions to a Chapter and is the highest commendation awarded by a local Chapter in the Society. Wolfgang joined the NIRS in November 2013 and immediately took an active role in club activities. 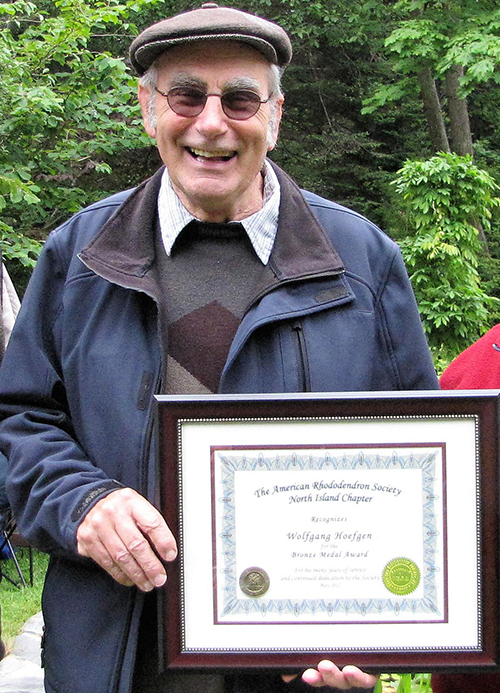 Wolfgang became the Chair of the Comox Valley Rhododendron Garden in June of 2014. He has been instrumental in maintaining and enhancing this show garden and keeping the work party teams productive and happy. With his years of experience as a nurseryman, Wolfgang was a natural fit for our newly formed Propagation Group. Wolfgang has been an excellent leader for the group, planning learning opportunities and making sure everyone has a chance to participate. Through his knowledge and gentle guidance he has been a key contributor to the success of this venture. Wolfgang is very well organized and has worked many hours behind the scenes to make sure that both the Rhodo Garden and Propagation Group run smoothly. Despite his skill and extensive knowledge, Wolfgang is very modest about his contributions and encourages others to take center stage. Wolfgang continues to propagate at home and has a particular interest in conifers and companion plants. To the delight of both the public and our members, he has shared these as a vendor at our Rhodo Truss Show and Sale. Wolfgang and Wilma have opened their beautiful garden to the public for our Mother’s Day Garden Tour and hosted our members to small and large group tours. In continued support of the club Wolfgang became a Director on the NIRS executive board in May 2016. It was with great pleasure that we thanked Wolfgang for his contributions to the club and congratulated him on being awarded the ARS Bronze Medal by the North Island Rhododendron Society.